What did Mahadevapura MLA Aravind Limbavali do in his 2nd term? Aravind Limbavali is the Member of Legislative Assembly (MLA) from Mahadevapura constituency. Minister of Higher Education and later Health and Family Welfare in 2008-13 BJP government. Bulk of his LAD funds have been spent on Bus Shelters – more than 5 crores. Arvind Limbavali is an engineering degree holder in civil stream. He was an active member of Rashtriya Swayam Sewak Sangh and Akhila Bharatiya Vidyarthi Parishad, and eventually became a Bharatiya Janata Party member and held many positions of importance. Limbavali became a Legislative Council member in 2004 only to resign and contest elections in 2008 from Mahadevapura. When the party came to power, he became a Minister in Yeddyurappa’s cabinet, holding the portfolio of Higher Education and later Health and Family Welfare. Limbavali won the 2013 election too, from the same constituency. Mahadevapura is a reserved constituency for Scheduled Caste. He was a member of Committee on Public Undertaking. 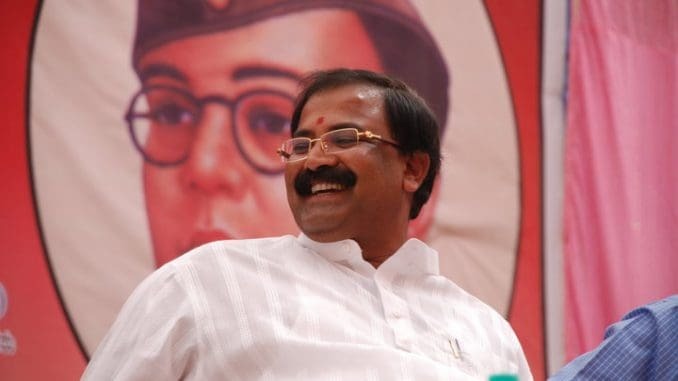 Limbavali is a front line leader in Bharatiya Janata Party, and is a general secretary. His Twitter handle and Facebook page actively promote the causes dear to the party and reacts to the issues in news from the city and the state, along with posting the news about the MLA. On June 30, 2015, Aravind Limbavali intervened along with other BJP leaders, asking the government to pay homage to the farmers who committed suicide. The session did not pay homage, that day, but the topic of farmer suicide was discussed in detail. On November 23, 2015, Limbavali participated in the discussion on garbage problem in Bengaluru. He outlined the dumping issues across the city, confusion among BBMP officials on who has to clear waste from drains, waste processing lobbies etc. On November 26, 2015, Limbavali participated in discussions, demanding the resignation of Social Welfare Minister Anjaneya in the backdrop of allegations of corruption against him and his family, which came to light during a sting operation. On 24 March 2017, he got the reply for a starred question he had asked on load shedding in Bengaluru and beyond, and participated in related discussions that involved Power Minister D.K.Shivakumar. On June 14, 2017, Limbavali drew the attention of the government towards BMTC’s refusal to transfer a land required to build a 100-bed government hospital in Siddapura to the Health Department. After much heated debate, the concerned ministers promised to solve the tug of war between Transport Department and Health Department within two months. On June 20, 2017, Limbavali participated in the discussion on an amendment to Universities act, and questioned the government on the intentions of some terms of the amendment, hinting at the hidden agenda by the government, to take control of appointments of chancellors. His experience and knowledge, as the Higher Education Minister in the previous term, got reflected in the debate. On 18 July 2016, Limbavali got the reply for a starred question he had asked on encroachment of government land in Mahadevapura assembly constituency and steps taken to redeem them. Limbavali has asked many questions especially on topics like Education, Social Welfare and notable Urban Development – TDRR for Land Owners, Clearing the Rajakaluves, Roads and Signal Free corridors, Odor problem in Bellandur and Varthur Lake, Garbage etc. March 8, 2018: Aravind Limbavali protested against Lokayukta stabbing – says law and order has broken down in Bengaluru. January 19, 2018: When Bellandur lake caught fire, Limbavali assured people that necessary actions will be taken to control it. December 22, 2017: Aravind Limbavali promised solutions for Bellandur pedestrians, during a protest against problems in Outer Ring Road. October 2017: President speech praises Tipu Sultan. BJP alleges that President Kovind’s speech was scripted by the Congress. Limbavali says “They have misused the President’s office”. February 25, 2017: Arvind Limbavali joined people who gathered outside HAL Police Station to protest against sexual harassment on a three-year-old baby. January 2017: Limbavali went to Thubarahalli to address a situation with a disputed road in Thubarahalli near Varthur, and assured people of speedy action. November 2016: Corporator lashes out at Limbavali for allowing events on encroached lake beds. October 2016: Limbavali stood by the property owner who had signed up for the joint development of a property where the building collapsed at the construction stage. He said the developer and BBMP officials were responsible. December 18, 2015: Limbavali expressed his support to a citizen protest meant to repair the roads. He said it will help him increase the pressure on the government to provide more grants for more grants for basic infrastructure. April 18, 2015: Limbavali participated in Prajavani-Deccan Herald Jana Spandana programme, and answered the queries by people. May 29, 2015: Limbavali encouraged a private company to help restore Varthur and Yamalur lakes with microorganisms. About 1000 litres of microorganism solution was sprayed on the lake as a pilot. June 8, 2013: A news report from The Hindu says that Limbavali influenced decisions on the Metro Rail alignment and station locations in Mahadevapura area, while he was a minister. – Aravind Limbavali profile on Opencity.in. Limbavali’s speeches and social media accounts talk about various civic issues in his constituency, like road widening, traffic, waste, slums/illegal settlements, etc. He organises large meetings to hear citizens grievances but is not known for closing those issues. He is also seen to organise a number of job fairs. 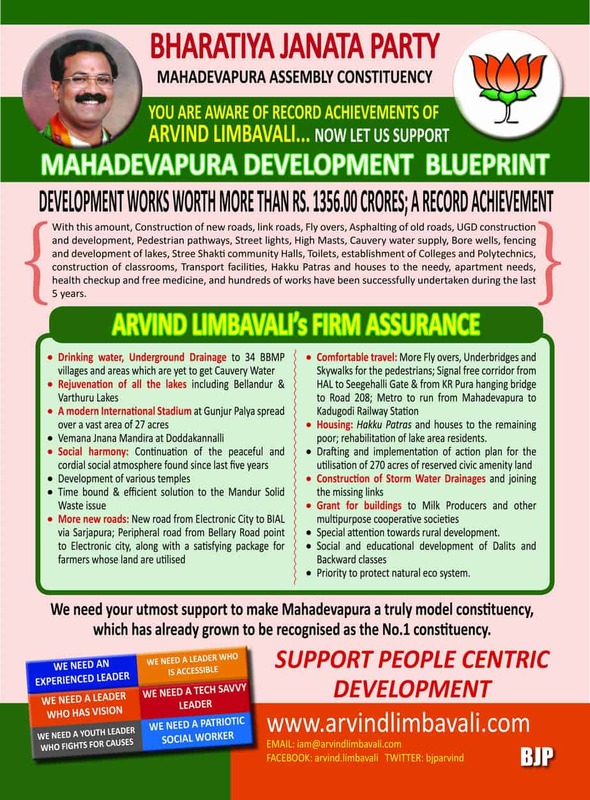 ☛ How did Mahadevapura MLA Arvind Limbavali spend his LAD funds? A perception survey conducted in Mahadevapura assembly by Daksh gives Aravind Limbavali 6.022 points out of 10. This compares to 6.07 average scored by Bengaluru MLAs and 7.07 averaged overall Karnataka. 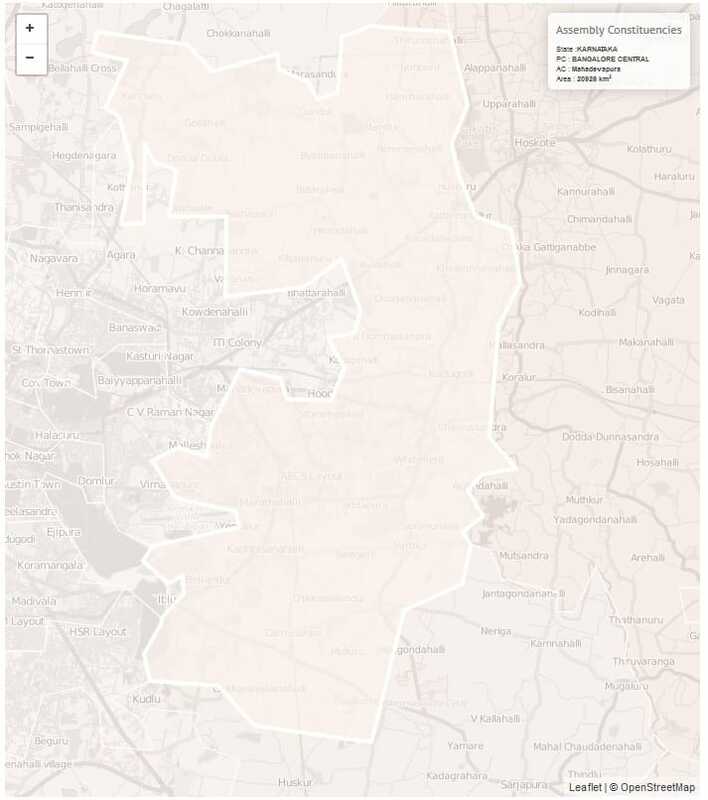 For full data of the survey, visit Opencity.in. Anywhere you go in Mahadevapura Constituency you will be greeted with the following perennial problems. The only exception may be inside the gated communities, Office complexes. 1. Dusty, multiple time dug up, pothole ridden, partially encroached roads with uncleared garbage strewn every where. 2. Stinking, clogged, overflowing, un covered drainage. 3. Perennial, mis managed traffic problems, pollution everywhere. Zero enforcement of Traffic rules. 4. Severe water problem throughout, even after the newly provided Kaveri water in some of the areas. Water tankers clogging the roads is a familiar sight. 5. No Public parks, Play areas, Greenery, Lung space. Heavily polluted and encroached lakes. Is the situation improved in the last 10 years? OR worsened ? Are you confident of any improvement during your lifetime? 5lakhs ONLY for Road Improvement is a pathetic number. Water scarcity is the major problem for villagers in our constituency. Road (potholes, Open drain, no UGD, no footpath) are the major problem for the apartment residents. MLA for 10 years, but his performance is below average according to above data. He seems very active in fB and twitter but failed to utilize his funds promptly. We need to explore the opponent candidate AC.Srinivas or some AAP candidate. MLA had ignored Kasavanahalli area completely. Apart from Asphalting road, he has done nothing! This is the ground reality. From a seasoned MLA like him, much more was expected. My score will be 1/10. We need more options as MLA Candidates in Mahadevapura.